Crafted for those with high impact sensibilities, Aspinal's Faberge Style Cufflinks underpin your style with flair and decadence. Handmade to ensure our signature luxury finish, the enamel is fired to reveal its translucent, marble-like qualities. 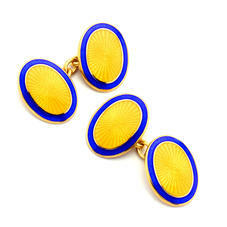 A choice of sterling silver and exquisite 22ct gold is inset with an array of arresting shades, from cobalt blue to red. Complement the sumptuous nature of these cufflinks with a formal leather belt or add a leather cufflink box to create a perfect gift. 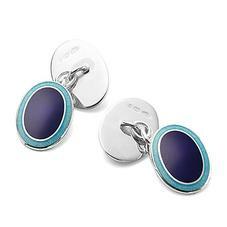 Our Faberge Style Cufflinks in solid Sterling Silver are meticulously handcrafted in England. The enamel is fired to the highest quality giving it a magnificent marble translucent appearance. Everything about our cufflinks simply oozes quality, style and distinction and each pair comes in an exquisite Aspinal signature jewellery presentation box.